Everyone is familiar with white, or colorless diamonds, the type immortalized in engagement rings. While it is common knowledge that white diamonds are amongst the world's rarest and most beautiful stones, not as many people are familiar with an even more valuable and aesthetically pleasing type of diamond: extremely rare natural colored diamonds. Colored diamonds are extremely rare, and much more so than clear or colorless diamonds. In fact, the formation process of colored diamonds occurs so rarely in nature, that less than 1 carat of colored diamond is found for every 10,000 carats of clear diamonds mined. Given their rarity, colored diamonds are also considered significantly more valuable, and demand is considerably higher. However, not all colored diamonds are equally rare. For example, black, brown and yellow diamonds occur much more frequently than green or blue diamonds. For comparison, only 2 to 4 major blue diamonds are released to the market every year, and only 50 Fancy Vivid blue diamonds have been sold at auctions since 1999. Which Colored Diamond Is Most Rare? In comparison, red diamonds, the rarest of all the colored diamonds, occur so infrequently that even experienced jewelers never see pure, or Fancy Vivid red diamonds in their lifetime. Few colors of fancy colored diamonds come in only a single color intensity, and red diamonds are one of these rare stones. Red diamonds occur in only the Fancy intensity, and only around twenty to thirty true red diamonds are known to exist in the world. Most of these are less than half a carat in size, and valued at amongst the most expensive diamonds in price per carat. The formation process of colored diamonds is largely similar to that of white diamonds: all diamonds are composed of carbon atoms that are transformed by extremely high temperatures (around 1300 degees C to 2000 degrees C) and tremendous pressure into a crystalline structure. These transformations occurred in the Earth's mantle 150 kilometers below the surface, as a result of geological processes that lasted millions of years between 550 million to 4 billion years ago. As they are composed of the same element and transformed by the same process, colored and colorless diamonds have the same material properties, scoring 10 on a Mohs scale, which makes them the hardest natural material on earth. So What Makes Them Different From Colorless Diamonds? Despite being composed of the same element, being acted upon by the same physical processes, and having formed in the same time span and geological region, there is one small but key difference between the creation of colored and colorless diamonds. This singular difference involves a chemical interaction with foreign particulates that integrate into the diamond's carbon structure during the crystallization process. This chemical process can include interactions with other elements such as boron, nitrogen, as the result of uncommonly high temperatures or pressures (as is the case with red or pink diamonds), due to radiation (such as with green diamonds) or even due to a higher than usual concentration of inclusions of carbon, the native element (as is the case with black diamonds). Depending on how the chemical process of diamond formation is affected, and by which abnormal factors, the result is an extremely rare and exceptionally beautiful natural colored diamond. How Many Colors Do Colored Diamonds Come In? 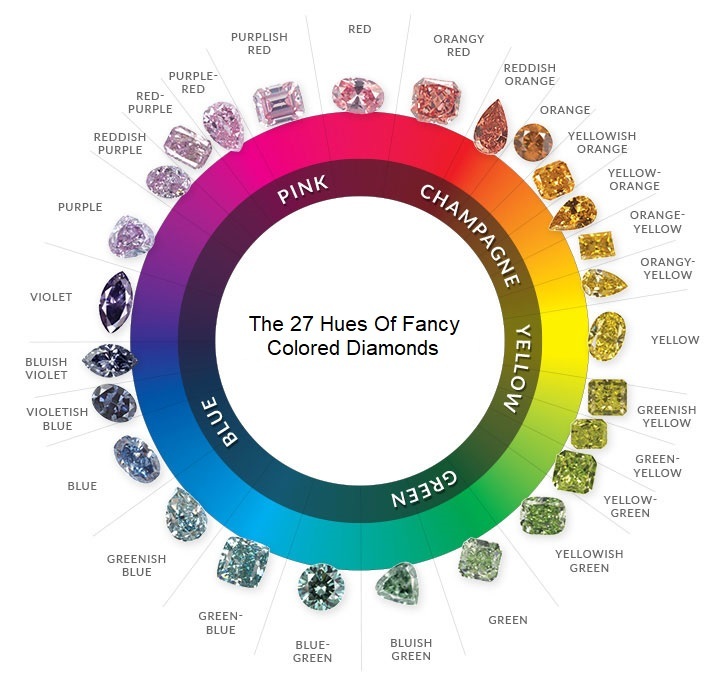 Diamonds come in 27 base colors, listed in the color wheel above. However, with the varying levels of intensities and modifying hues, this results in over 200 color combinations. Orangy-Red - Orangish-red diamonds feature a primary reddish hue and a secondary orange hue, producing a fiery, vibrant gemstone. Reddish-Orange - Reddish orange diamonds exhibit a primary orange color, with a secondary reddish tinge, for a radiant, stunning diamond. Yellowish-Orange - Yellowish-orange diamonds posses a primary orange hue, complemented by a faint yellowish tinge, producing an effervescent diamond. Yellow-Orange - Yellow-orange diamonds exhibit a primary orange color, tinged by a vivid yellow hue, for a radiant gemstone. Orange-Yellow - Orange-yellow diamonds boast a primary yellow color, with a secondary orange tinge, producing a fiery diamond. Orangy-Yellow - Orangish-yellow diamonds posses a primary yellow tone, with an orangish tinge, for a beautiful, vibrant diamond. Greenish-Yellow - Greenish-yellow diamonds feature a yellow primary tone, with faint greenish tinges, for a truly unique diamond. Green-Yellow - Green-yellow diamonds boast a primary yellow hue, with a vivid green tinge, for a truly one of a kind diamond. Yellow-Green - Yellow-green diamonds feature a green primary color, with a yellow secondary tinge, producing a dazzling diamond. Yellowish-Green - Yellowish-green diamonds posses a green primary hue, with a faint yellowish tinge, for an intriguing looking diamond. Bluish-Green - Bluish-green diamonds boast a green primary color, with a bluish undertone, for a vibrant diamond. Blue-Green - Blue-green diamonds posses a deep green color, with a deep blue tinge, for a dazzling, deeply colored diamond. Green-Blue - Green-blue diamonds posses a primary blue hue, with a green secondary tone, for a truly spectacular diamond. Greenish-Blue - Greenish-blue diamonds feature a blue primary hue, with a faint greenish tinge, for a subtle, yet radiant, diamond. Violetish-Blue - Violetish-blue diamonds feature a blue primary color, with a violetish tint, for a truly unique diamond. Bluish-Violet - Bluish-violet diamonds boast a violet primary tone, with a faint bluish tinge, for a radiant diamond. Reddish-Purple - Reddish-purple diamonds boast a purple primary hue, with a reddish tinge for a vibrant diamond. Red-Purple - Red-purple diamonds boast a purple primary tone, with a deep red secondary tone, for a stunning, eye catching diamond. Purple-Red - Purple-red diamonds feature a red primary tone, with a purple secondary tinge, for a colorful, vibrant diamond. Purplish-Red - Purplish-red diamonds boast a red primary tone, with faint purplish underscores, for a spectacularly colored diamond. In addition, the various clarity, cut, and shapes of colored diamonds mean that your invaluable colored diamond is truly one of a kind. The least expensive of the colored diamond colors include brown, gray, and yellow - the most commonly occurring of the colored diamonds. Although these colored stones are more rare than white diamonds, they typically cost less than white diamonds of a comparable quality and carat due to generally lower levels of demand. However, the relatively lower cost is not applicable for stones with stronger intensities such as vivid or fancy vivid yellow, or for a diamond with a modifying color that is more valuable, such as a blue gray diamond. The mid-range priced level of diamonds include stones with lower saturations due to the presence of secondary colors. Price ranges for this group of diamonds vary greatly depending on the strength and tone of the secondary color, however typically diamonds in this category are generally more expensive than white diamonds. Mid range colored diamonds often include orange diamonds, which commonly come with strong modifying hues. The mid range diamonds also includes Intense yellow or "canary" diamonds, which are more expensive than the typically "affordable" yellow diamonds. The most expensive, and rarest, colored diamonds are significantly more expensive than white diamonds, with a value that rises exponentially the higher the carat and color intensity. These includes pink, purple, green, blue, violet and pure or "pumpkin" orange diamonds. Even the base valuations of price per carat usually start in the tens or thousands of dollars. Loose diamonds of these colors are typically sold through auctions for bids that are easily in the millions of dollars. Given the rarity and demand for these colors, they also tend to make secure investments that are likely to see exceptional returns. The Vivid Green Diamond sold for USD $3.08 million, a price of $1.22 million per carat. The 12.03-carat Blue Moon sells for nearly $50 million - the only diamond to ever sell for more than $4 million per carat. Despite the stunningly high prices of rare colored diamonds, there is one diamond color so rare that only 20-30 have been known to ever exist in recorded history; and even most of these are extremely small: half carat or smaller. Red diamonds are the most rare and most expensive of all the colored diamonds, and come only in a single intensity: Fancy. They are so rare, and there is such a small set of pure red diamonds on the market historically, that it is very difficult to determine prices for them. Even when red diamonds appear with a purple modifying color (the most commonly found secondary hue in red diamonds), prices vary dramatically based on the percentage saturation of red in the stone. However, typically, a 0.20ct purplish red can cost about $300,000 per carat and 0.40ct about $500,000. The red color in diamonds is so rare that even if the red color appears in a diamond at an extremely low saturation, as a modifying secondary color, the price of that diamond will rise exponentially. Thus, while a brown diamond costs only about $2,400 per carat, a reddish brown diamond can cost the astonishing sum of over $30,000 per carat - over 12 times as much due to the effect of the red color! No other color has such a drastic effect when it appears as a modifier. The most known red diamond is the Mousaieff Red - a 5.11ct Pure Red diamond that was purchased for over $ 1.6 million per carat. Recently, at the 2013 Argyle Pink Diamond Tender, a 1.56 carat red diamond known as the Argyle Phoenix, was sold for over $1.25 million per carat. What Factors Account For The Disparity Of Pricing Within The Same Color Of Diamond? The intensity color grading of a diamond is based on a combination of saturation and tone, and represents the color's strength and vibrancy. The color grading of the GIA, is divided into 9 color intensities: faint, very light, light, fancy light, fancy, fancy intense, fancy vivid, fancy dark, and fancy deep. This is the primary factor that affects the cost and demand of a diamond - the higher the intensity of the color, the rarer, and more valuable the diamond is. Other Than The Color Of The Diamond, What Are The Factors That Influence Prices Of Colored Diamonds? While the intensity of the color, is the primary factor that influences the pricing of diamond, the other 3Cs - Carat, Clarity and Cut - are also important considerations. Carat - represents a diamond's weight (not size). As a rule, the more carats, the higher the price per carat, as well as the higher than a price overall. Clarity - indicates a stone's structural perfection. While flaws are not usually visible to the human eye, the clarity scales set by gemological institutes such as the GIA, specify the diamonds' level of internal clarity when magnified 10,000 times. Cut - refers to the way the diamond is polished to best flatter its natural qualities, maximize its color, augment its sparkle and make it look larger than its actual carat weight. Colored diamonds, are generally cut into pear, radiant, cushion, or other unconventional shapes as such fancy shapes, which reflect less white light, work to enhance the intensity of the color. It is possible to find colored diamonds in rounds, princess and emerald cuts. However, as it is very difficult to cut colored diamonds into these shapes without losing color, these shapes are usually rare, and extremely valuable. The only diamond to ever sell for more than $4 million per carat. - In spring 2016, a Geneva-based fund manager famously purchases a highly rare colored diamond, a vivid orange, at the price of $1 million per carat. In May 2016, a 14.62-carat blue diamond sells for $57.5 million at another Geneva auction, becoming the most expensive diamond in the world ever to be purchased in auction. In just the last two years, these are some of the high profile, high price colored diamond purchases that have made the news, and behind these headlines are an indication of the trends that signal good news for those considering investing in colored diamonds. Prices paid at auctions are considerably over initial valuations, and colored diamond prices risen 122% in the last ten years, on average. On the higher end of the spectrum, the price of extremely rare colored diamonds such as pink stones increased 180%. On the lower end, for more affordable colored diamonds such as blue and yellow, prices are up by around 70% and 90%, respectively, over the same period. It's clear the marketplace has transformed. One of the drivers is a surge in loose colored diamonds being purchased as investments, to serve as discreet, valuable, and lucrative assets. Ultra rich investors are counting on the forecasted growth of colored diamond values and the relatively stability of these "recession proof investments" to bank on considerable profits with low risk. Investors include professionals and funds investing on behalf of ultra rich clients who buy colored diamonds as alternative investments. This new demographic of investors has significantly expanded the diamond market, traditionally dominated by rare gem collectors and connoisseurs. China in particular is seeing a growth in the ranks of newly made and young millionaires, who are on average under 40 years old. These youthful, nouveau riche investors don't only want to secure their wealth, they want to do so in style. They're investing increasingly in what are coming to be called "passion funds", long-term investments in tangible and usually rare assets. These investments appreciate over time and are generally safeguarded against unpredictable inflation or market fluctuations. Passion fund goods include fine wines, works of art, collectible musical instruments, as well as rare colored diamonds. In addition to guaranteeing high returns, part of the enticement of these niche investments is that they are luxurious and reflect the social status of their owners. A significant advantage of diamonds over other passion fund investments is that they are an asset that investors can actually use and enjoy at no cost or depreciation to the asset itself. Due to the nature of collectables, assets are largely valued for their rarity and limited supply. As one of the world's rarest commodities, it's no wonder that Fancy Colored diamonds are where an increasing number of wealthy investors are choosing to put their money. Fancy colored diamonds are extremely rare, and much more so than white or colorless diamonds. According to the GIA, only 1 carat of colored diamonds is found for every 100,000 carats of colorless diamonds mined. Amongst these, some rare colored diamonds are so uncommon, such as the coveted red diamond, that few have ever been seen on the market. The GIA laboratory did not come across a single red diamond between 1957 and 1987. In the uncommon instances that one comes across this rare colored diamond on the market, prices are extremely high, and the stones are typically purchased at auctions for amounts staggeringly above their pre-sale valuation. The investment forecast of diamonds predicts that valuations are only set to rise as diamond production is set to to drop significantly within the next 20 years. As diamonds are a non-renewable resource, a precious mineral formed through millions of years of creation, the availability of diamonds on the market is dependent on existing deposits, which are being depleted at a much faster rate than there are being renewed. Unless new mines are discovered in the near future, colored diamonds will be even more rare than they are now - and considerably more valuable. Investors must be invited to the viewings, which are held at secret locations in London, New York, and Hong Kong. These secret viewings of the world's most expensive colored diamonds create a covert ultra niche market accessible only by the initiated - which significantly enhances the stone's allure and perceived value. To be a part of this growing buyer's club for the world's most valuable diamonds, one must be a part of the initiated elite - a much sought after status in the growing ranks of the super rich. The discretion and anonymity that surrounds the viewings, and which are so valued by the often immensely private ultra rich investors, continues throughout the purchase process. Diamonds are an extremely discreet investment: transactions don't need to be registered with government agencies or financial institutions. Ownership can even be anonymous if the investor so prefers. Additionally, Fancy color diamonds are easy to transport privately. Diamonds have a high size to value ratio: as they are so small, they are highly portable, which makes it easy to transfer wealth.